The first weather satellite in a series of spacecraft originally known as the Television Infrared Observation Satellites (TIROS) was launched on April 1, 1960. By the mid 1970's NOAA and NASA agreed to produce the series operationally based on the TIROS-N generation of satellites. TIROS-N, a research and development spacecraft serving as a prototype for the operational follow-on series, NOAA-A through NOAA-N-Prime was on launched October 13, 1978. Beginning with NOAA-E, launched in 1983, the basic satellite was 'stretched' to permit accommodation of additional research instruments. This became known as the Advanced TIROS-N configuration. Some of the additional instruments flown include: Search and Rescue; Earth Radiation Budget Experiment, and the Solar Backscatter Ultraviolet spectrometer. Three of those instruments, Search and Rescue Repeater, Search and Rescue Processor and Solar Backscatter Ultraviolet Radiometer, became part of the operational program. The primary sounding instrumentation has remained essentially unchanged until the addition of Advanced Microwave Sounding Units-A and B on NOAA-K (15). The satellite design life throughout the series has been two years. The lifetime is a cost/risk tradeoff since more years normally result in a more expensive satellite. To mitigate that risk, the NOAA-M satellite uses the most reliable NASA-approved flight parts, Class S, and considerable redundancy in critical subsystem components. The instruments are not redundant, so they are purchased to a three-year design life in order to enhance their expected operational reliability. Because of the inherent reliability built in and the extensive ground testing prior to launch, this series of satellites has demonstrated performance well exceeding the design lifetime. TIROS-N was launched October 13, 1978, and was the first satellite in the fourth generation operational environmental satellite system. TIROS-N was a research and development spacecraft serving as a proto flight for the operational follow-on series, NOAA-A through N' spacecraft. The spacecraft was deactivated on February 27, 1981. NOAA-A (6) was launched June 27, 1979 and was totally deactivated on March 31, 1987, after nearly eight years of operational service. NOAA-B was launched May 29, 1980, and failed to achieve a usable orbit because of a booster engine anomaly. NOAA-C (7) was launched June 23, 1981, and was deactivated in June 1986. NOAA-E (8) was launched March 28, 1983. It was the first of the Advanced TIROS-N configuration satellites and included a stretched structure to provide growth capability; it also included the first search and rescue package. The satellite was deactivated on December 29, 1985. NOAA-F (9) was launched December 12, 1984, and was deactivated on February 13,1998. NOAA-G (10) was launched September 17, 1986, and was deactivated on August 30, 2001. NOAA-H (11) was launched September 24, 1988. Some instruments are currently in use to a limited degree. 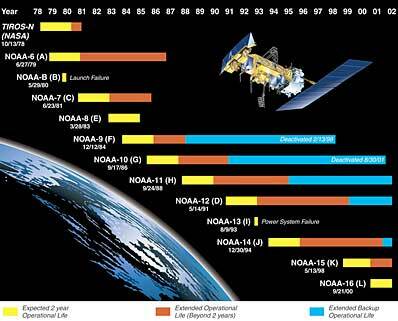 NOAA-D (12) was launched on May 14, 1991, and some instruments and other subsystems continue to operate satisfactorily. NOAA-12 was placed in standby mode on December 14, 1998, when NOAA-15 became operational. NOAA-I (13) was launched on August 9, 1993, and two weeks after launch, the spacecraft suffered a power system anomaly. Attempts to contact or command the spacecraft since the power failure have been unsuccessful. NOAA-J (14) was launched on December 30, 1994, and is currently designated the backup afternoon satellite. NOAA-L (16) replaced NOAA-J (14) as the operational afternoon satellite on March 19, 2001. NOAA-K (15) was launched on May 13, 1998, and is currently the designated operational morning satellite. It replaced NOAA-D (12) on December 14, 1998, as the primary morning spacecraft. NOAA-L (16) was launched on September 21, 2000, and is currently the designated operational afternoon satellite. It replaced NOAA-J (14) on March 19, 2001, as the primary afternoon spacecraft. Titan 2 - Description of the former ICBM missile converted to a space launch vehicle. NOAA-M - General overview of this weather satellite. Instruments - A look at the instruments aboard NOAA-M.